And the Winner Is ... Louisiana State! Congratulations to Louisiana State, winner of the Wiz Readers' Choice Poster Schedule of the Year. The Tigers saved the best for last. After finishing second to Auburn in group voting, LSU charged to a convincing win in the final, garnering 44.8% of the the 8,067 votes cast to decide the winner. The Tigers' poster features a powerful image of shutdown cornerback Patrick Peterson over an image of Tiger Stadium. "This is a great honor for our university and our faithful LSU fans," said Jason Feirman, LSU's athletics publications director. "Winning this contest would not be possible without the community of fans of the LSU Football pages on Facebook and Twitter, along with our readers on LSUsports.net. They rallied the vote to put us in the top spot." "A tremendous thanks to our staff photographers Steve Franz for his photo of Patrick Peterson and Chris Parent for his photo of Tiger Stadium. Also a huge thanks to our Marketing & Promotions office and Sports Information office for assisting with the concept." “We take tremendous pride in putting out a unique poster for every sport at LSU and are humbled by the recognition." Copies of the poster can be purchased at LSUsports.net. It started with 78 posters. After two days of intense voting, we are down to 11 finalists. Now it's your turn to select the poster schedule of the year. The finalists' posters are displayed in alphabetical order after the jump, followed by the poll. Unlike Chicago, where citizens are encouraged to vote early and often, you get only one vote, so make it count. The poll will close Friday at midnight (Pacific), and we will crown the winner over the weekend. Good luck to all! One note: After debate with an inner circle of friends, the Wiz decided to include all runners-up who accumulated more than 100 votes. This was done in the interest of fairness and recognition of their efforts in the primary. It also expanded the list of finalists to 11 instead of the planned 10. Such is the power bestowed upon the Wiz. As always, click a poster for an enlarged view. Let's get to the grand finale! Let the Voting Begin for Poster of the Year! 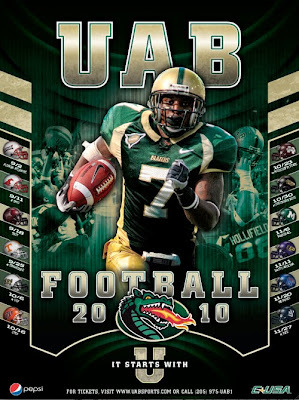 It's time to select the 2010 poster schedule of the year. It's a two-step process, and this is step one, which involves trimming the 78 posters displayed on the site to a manageable number of 10 finalists. You have until midnight Tuesday (Eastern) to vote on one team from each of seven groups. The seven group winners, along with the top three vote-getters among the runners-up, will advance to final. Finals voting will begin Wednesday and end Friday at midnight (Pacific). The defending champion is Iowa State. The seven groups with links to posters in each group are after the jump. Good luck! The journey has come to an end. North Carolina is our 78th and last Division I-A poster to be displayed for 2010. The Tar Heels made the most of this honor by producing two posters, one for the offense and one for the defense. North Carolina hasn't played since losing to Louisiana State, 30-24, in Week 1, but have a big game Saturday against Georgia Tech. Poster designed by Old Hat Creative. Posters have been tagged in seven groups and you'll be able to vote on one poster in each group. The winner of each group will advance to the final. The top three vote-getters among the runners-up will also advance. Voting will end Tuesday at midnight (Pacific). On Wednesday morning, voting will begin for the 10 finalists, with the poll closing Friday (the 24th) at midnight (Pacific). The winner will be announced on Saturday, the 25th. The defending champion is Iowa State. The Miners are coming off a 54-24 loss at Houston, but that was likely the toughest game among the first eight. Texas El Paso, which beat Arkansas Pine Bluff in its opener, plays host to rival New Mexico State on Saturday night in the Battle of I-10. Games against Memphis, New Mexico, Rice, Alabama Birmingham and Tulane follow, and the team could be no worse than 6-2 entering its final four games against Marshall, Southern Methodist, Arkansas and Tulsa. Last year, the site displayed 69 posters. This is poster No. 77 for 2010. Thanks to Joe!